If you’ve followed our blog at Diffuser Specialist, we’re certain you’ve come to enjoy our articles full of useful information about home lighting products and repair. Another thing you may have noticed about our blog is that we also love trailblazing lighting design installations that turn simple fluorescent lighting solutions into wondrous works of art. Today we’re going to have some fun and invite you to join us for a night out on the town as we look at some beautiful bar lighting concepts. Here is a bar that everyone in the neighborhood will want to be at on a Friday night. 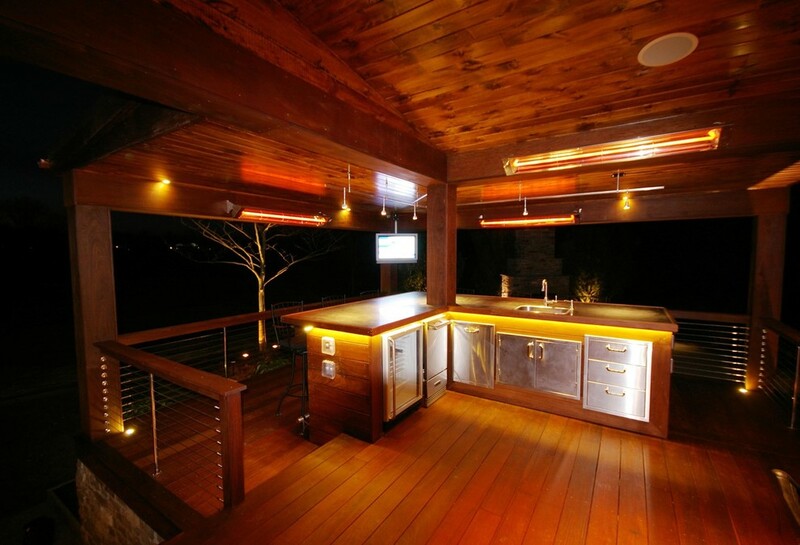 Here we see a variety of lighting concepts that come together to create a cool, clean feeling. Using recessed lighting above the bar area creates an glow on the bar top, while the fixtures on either end provide a “book-end” feeling. 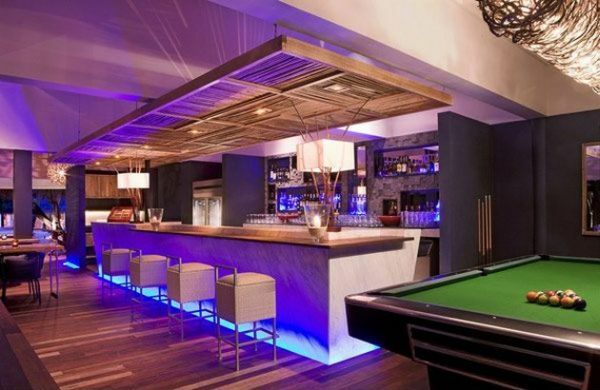 Glacier-blue LED lighting surrounds the perimeter of the bar and serves to contrast against the warm hues of the wood floor. This small, outdoor deck bar is truly a treat. We can see it being a focal point of any number of nippy autumn nights with a few friends. In fact, the orange bulbs that were selected cast an almost campfire-like inviting glow that would draw people like moths to a flame. Notice how the downlighting underneath the bar edge rally makes the brushed metal drawers and cabinets pop. Compact, clean, and creative. 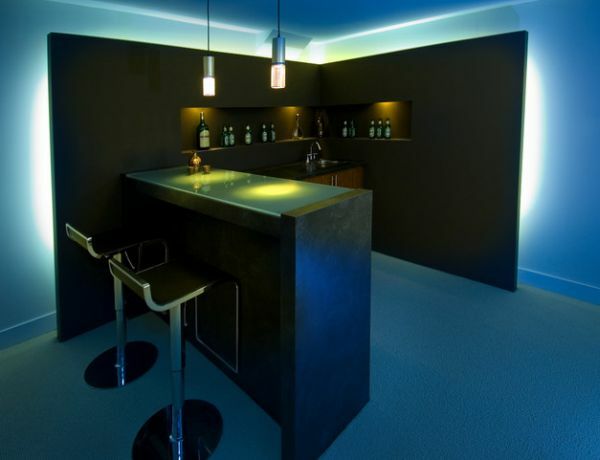 This small at-home corner bar has it all and is really brought together by clever lighting solutions. Opting to only use two smaller hanging lighting fixtures, the real ambiance is created by the false wall behind the bar. 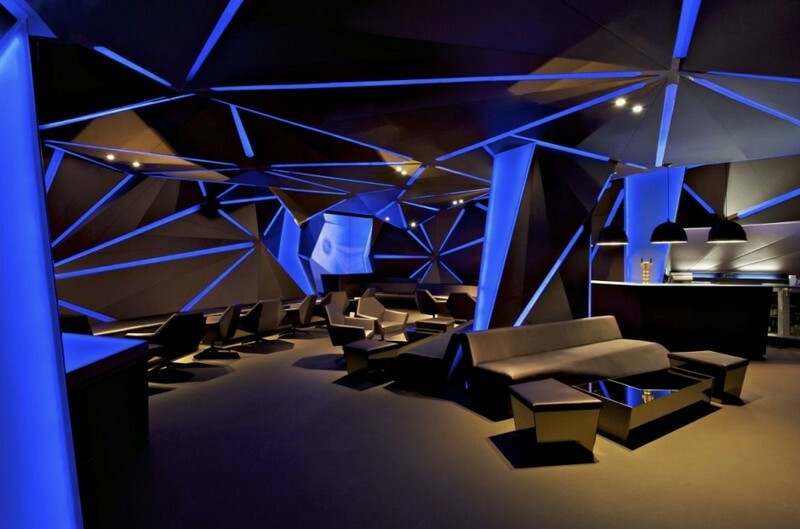 Behind the false wall, fluorescent lights emanate a glow that highlights the bar area without any harsh, directional lighting whatsoever. Welcome to the future. This bar seems like it’s straight out of Blade Runner or Spielberg’s AI, but it exists today as a brilliant example of integrating lighting into architecture. While there are still the standard fixtures scattered throughout, the area is primarily lit by the angled walls and ceilings of LED light. Don’t think that you’ll just be limited to blue. These panels have the ability to change color at any time for special occasion or desired mood. Lighting can make or break the most well designed space! While we don’t offer interior design services for your next home bar concept, we can help you find a custom lighting solution. And remember, if we don’t have it – we’ll make it! I didn’t know that downlighting underneath the bar edge really makes the brushed metal drawers and cabinets pop. My mom wants to remodel our kitchen to make it look modern. My sister suggested buying home lighting products and shared this article with her.